This article is being written on an iPad at my favourite restaurant. Consider the workplace of the future and the possibilities of digital transformation. Imagine the scenario of a worker sitting in a cubicle with two screens attached to a PC, showing up at 8:00, leaving at 5:15 (because they are ambitious), broken up by a day or two a month of working from home. This is short sighted. Surely there is a better way to be successful, drive business forward and meet goals. However, the workplace of the future cannot just happen on its own. To drive things forward, it is imperative to keep an eye on lessons from the past, as well as present. And, when it comes to technology, this means determining which innovations to keep, which to refine and which ones simply don’t make the cut. Printing is a technology that falls into all three categories. Printing a birth certificate - keep. The workflows that require a physical document - refine. Email printed to share with a coworker - retire. As we advance our digital capabilities we need to ensure that we retain a connection to our physical world. Ensuring that the technologies we deploy can be universally used and that crucial information can easily live past the next couple of upgrade cycles will be essential in your productivity moving forward. Mobility is a great showcase to demonstrate how one of today’s most fundamental technologies can be refined to fit future needs. Actually, it doesn’t just fit future needs, it makes some of our future technologies possible. This will remain true at least for the foreseeable future, as we cannot claim to know what will happen in 2099. For the last 10 to 15 years, enterprise mobility has largely focused on security. Not that security is not important - it definitely is - however, it has somewhat drawn the focus away from the productive, value-creating scenarios that mobility has to offer. There is so much more than just email. This article is being written on an iPad at my favourite restaurant. Earlier I shipped a couple boxes to an event using my phone and tomorrow have a presentation for an important client coming up that I’ll also do from my iPad. However, in this process I needed shipping labels. And, I was tasked with finding one of the couple printers in our company that supports AirPrint. Those of course exist, almost every new printer comes with various mobile implementations, but none of them are fit for the enterprise. Once enabled, every device on the same network as the printer has unrestricted abilities to print. There are no permissions, no analytics, no rules. In addition all user devices have to be on the same network with the very devices we use to process some of our most valuable, most sensitive information. This is in no way a “best practice” for a secure environment. In addition, with everyone having access to everything there’s bound to be confusion, conflict and chaos. That means a bunch of expensive, time-consuming help desk tickets to temporarily restore order. In the traditional enterprise world there are print management tools to remotely install drivers or manage print servers, grant or restrict access to printers and features like color printing. In the spirit of refining today’s technology for tomorrow’s use, mobile devices should be provided with the same. This is why a professional solution for mobile printing in enterprise is essential. There are two primary components that refine printing for use with mobile devices. One: The backend management element for IT to bring together users, printers and security through an existing EMM/MDM solution. 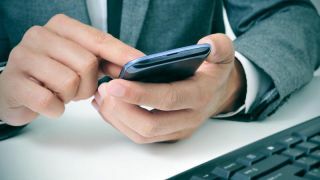 Integration with an existing EMM, such as MobileIron, AirWatch or XenMobile, is key because it ensures that apps, data and devices of employees who are mobile and have access to printing are securely managed. In the age of GDPR, data breaches and general security concerns mobile device should also have access to secure and follow-me printing. Once sent from the user’s device the jobs are encrypted, stored and can be retrieved with a badge swipe, PIN or - most convenient - with a scan of a QR code from the mobile device confirming the user is at the printer ready to retrieve their document. And, going back to my original criticism of current printing from mobile devices: There is a convenient way to assign the correct printer to the correct user. With a seamless integration into Active Directory the existing user base is readily available, as is the existing print infrastructure. Our consulting teams would recommend turning off all mobile related services on printers and using our solution to make printers available to users, even those who are too old to natively support mobile devices. Permissions can also be assigned to ensure each user has access to the feature set to best fit their needs. Two: The user-facing portion consisting of an integration into the print dialogue provided by iOS or Android, as well as an app to connect to virtually any printer. As users have grown more familiar and comfortable with their mobile devices, they have come to expect crucial features to be provided by the platform and printing is no exception. The right solution delivers any company printer to the users known workflow the same way they would click file -> print on their PC or Mac. Mobile devices allow people to work untethered from the corporate campus. If enabled, they will be able to use the a mobile printing app to discover any printer that is on the same network as the user’s device or print a file type that may not yet be supported by a mobile app. A printed document remains one of the most understood ways to deliver information and it is crucial that we retain the ability to deliver information in such a universal way as we transform how we work. Innovation will continue to disrupt our workflows, encourage them to evolve but innovation can and will also ensure that users will not be left without access to the technologies required to make them successful even as platforms, paradigms and expectations radically change.